SINGAPORE -- For months, air traffic controllers and engineers have been holed up in a windowless room at Singapore's Changi Airport. This is the prototype of the control "tower" of the future. Gone is the traditional wall of glass affording a 360-degree view of runways, taxiways and gleaming jets. In its place is a panoramic digital screen that the Civil Aviation Authority of Singapore says provides a similar perspective. And the staff can see far more than they would with their own eyes: Advanced camera and video-stitching technologies allow tracking, panning, tilting and zooming in on a particular plane or area. The team continues to test the system, which processes a range of digital data to promote efficient air traffic management. If all goes well, Changi will be the world's largest and most complex airport to adopt this next-generation control tower setup. The aviation authority is turning to artificial intelligence to help the airport run smoothly as well. The ultimate goal is to accommodate more planes and passengers. This is Singapore's way of confronting a problem plaguing Asia's hubs: a severe and worsening capacity crunch. Passenger numbers in the region are growing so fast that airports have been unable to keep up. As the middle class expands, the Asia-Pacific air traveler count is expected to keep rising 4.8% a year over the next 20 years, well above the global average of 3.5%. 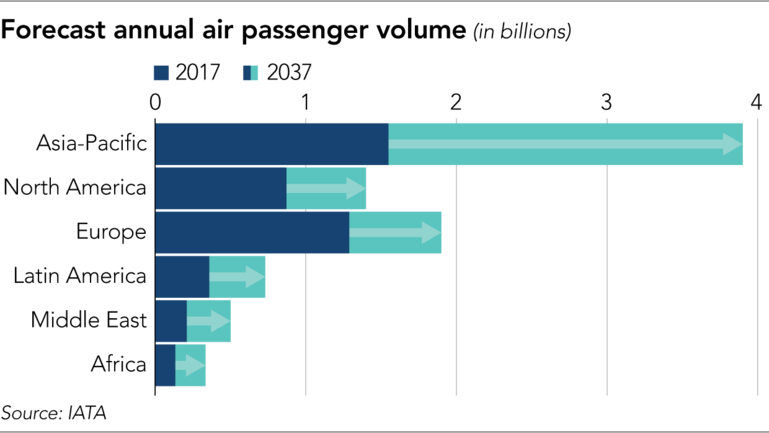 Put another way, 3.9 billion flyers are expected to be soaring over Asia annually by 2037 -- an increase of 2.35 billion -- according to the International Air Transport Association. "The world stands to benefit greatly from better connectivity," said Alexandre de Juniac, the IATA's director general. But he also warned, "At this rate, airports and air traffic control will not be able to handle demand." Not only is the passenger tally increasing faster in Asia than anywhere else, but the region also has the biggest mismatch between demand and airport development, according to Torbjorn Karlsson, senior client partner at consultancy Korn Ferry. Karlsson stressed that remote areas, particularly in archipelagoes like Indonesia and the Philippines, require better air connectivity for growth, and that inadequate hubs in the capitals could turn potential investors away. Governments are responding by aggressively promoting airport construction. In the Asia-Pacific region alone, 228 new airports are being built, according to the CAPA Center for Aviation, a Sydney-based industry think tank. That is more than half the global total of 427. Including expansion projects at existing airports, the region is spending a total of $316.5 billion to build up its gateways. Indonesia is a prime example of the construction rush. Only two years ago, Jakarta's Soekarno-Hatta Airport opened its third passenger terminal, and a fourth terminal is in the works. But officials have already revealed plans for another 100 trillion rupiah ($6.87 billion) airport nearby. "Construction of Terminal 4 and Runway 3 [at Soekarno-Hatta] is only to cover the current capacity gap," Muhammad Awaluddin, the president of state-owned airport operator Angkasa Pura II, told reporters on Nov. 18. "Added capacity [from the new airport] will ... reduce the risk of a further gap." Construction of the new facility, dubbed Soekarno-Hatta II, is scheduled to start in 2021. It will cover 2,000 hectares of, most likely, reclaimed land, putting it roughly on par with the existing airport. Soekarno-Hatta International Airport's Terminal 3, seen under construction in 2016, was just the beginning of Jakarta's airport expansion drive. Thailand is in buildup mode, too. The country plans to triple capacity at Bangkok's Suvarnabhumi Airport to 150 million passengers per year, Airports of Thailand, the government-linked operator, said in October. The airport, which opened in 2006 and is Thailand's largest, currently has an annual capacity of 45 million but manages to cram in 65 million. 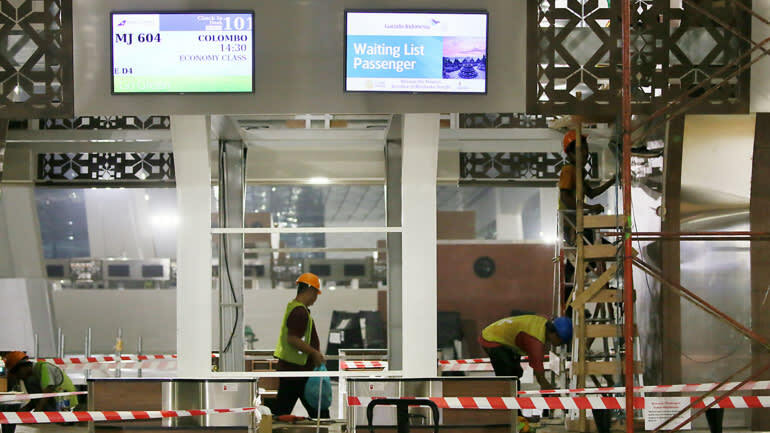 Asia's flurry of airport projects still might not be enough. DBS Group Research estimates $516 billion worth of airport investment will be needed over the next two decades. Paul Yong, an aviation equity analyst at DBS, warned that rising costs of land acquisition and construction will increase the burden over time, suggesting governments will have to rely on private capital "as a supplementary, or even primary, means of funding such projects." Yet most observers agree that money is not the real issue. "There is no shortage of funds, but there is a shortage of well-structured deals," said one investment banker in Singapore. "In Asia, when governments privatize airports, often the terms are not friendly enough to investors. Some governments try to transfer too much risk to investors." In the Philippines, one eager would-be investor has been waiting years for full approval. Ramon Ang, the president of beer brewer and infrastructure conglomerate San Miguel, once pitched an airport proposal to former President Benigno Aquino. Now he wants to build an "aerotropolis" in Bulacan, outside Manila -- an idea he proposed to President Rodrigo Duterte in 2016.